Background Obesogenic dietary intake is prevalent in young children and is associated with obesity and other adverse health outcomes in childhood and later in life. Objective To describe the barriers to and facilitators of obesogenic dietary intake in early childhood, in order to inform interventions and public health policies to prevent obesity. 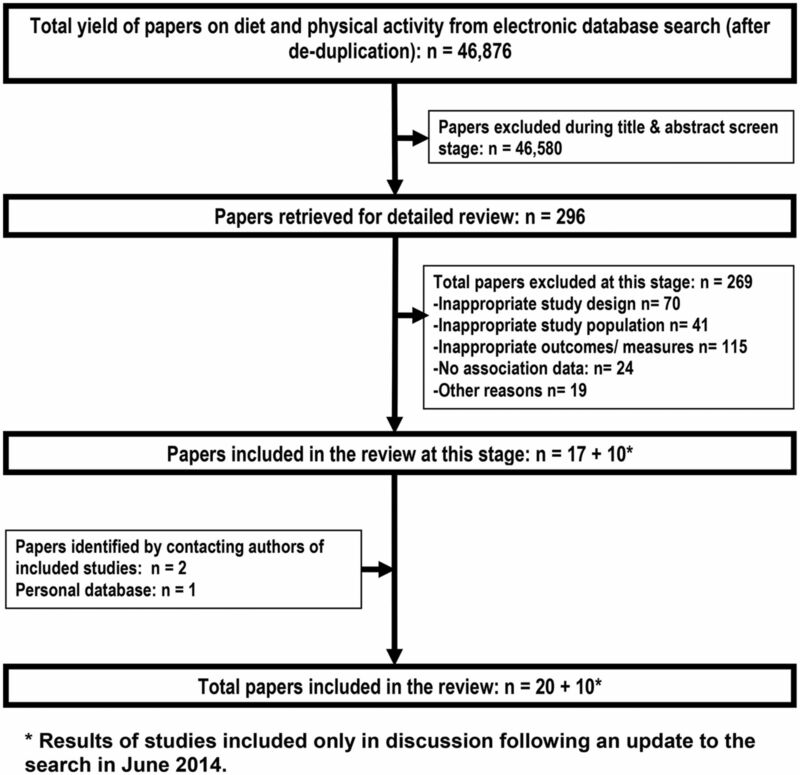 Design Systematic review of qualitative literature on factors influencing obesogenic diets in children aged 0–6 years. Data sources MEDLINE, EMBASE, CINAHL, PsycINFO, Web of Knowledge, British Nursing Index, ASSIA and Sociological Abstracts. Review methods Qualitative studies meeting the inclusion criteria were synthesised. Data were analysed by creating a thematic framework, underpinned by the socioecological model, which included familiarisation of data across the studies, indexing, charting, mapping and interpretation. Results 20 studies from the USA (10), Europe (6) and Australia (4) included the views of 1067 participants (901 parents/caregivers, 37 children, 87 teachers, 15 dieticians and 27 nursery staff). Study designs included focus groups (n=16), individual interviews (n=6) and ethnography (n=1) with some studies using more than one design. Despite wide differences in the study context and focus, several consistent themes emerged. Parental factors increasing young children's obesogenic diets were: negative parent/family/peer modelling, lack of knowledge, time constraints, using food as reward, affordability and concerns about child's health. Child preferences also increased intake. Environmental factors increasing intake include: availability, advertising, societal, cultural and preschool/childcare influences. Conclusions Future intervention strategies should aim to promote modelling of positive behaviours, create home and preschool environments that promote healthy diets, and simultaneously target factors at the family and preschool/childcare levels. Trial registration number This review is one of a series of systematic reviews on the determinants of obesogenic behaviours in young children, registered with the International Prospective Register for Systematic Reviews (PROSPERO), CRD42012002881. To our knowledge, this is the first systematic review of qualitative evidence on factors influencing obesogenic dietary intake in preschool-aged children and we found that carers/parents, family and peer modelling significantly influenced young children’s diet. We conducted a comprehensive search to identify relevant literature and followed strict systematic review procedures to minimize selection and reviewer related biases. Data was synthesized using a thematic framework, underpinned by the socio-ecological model. Ten (out of 12) factors/themes were consistently reported by nine or more studies. Almost all studies were conducted in developed countries and study participants were mainly mothers, which could limit the generalisability of the findings. However, most studies addressing this topic are quantitative and on school-aged children and adolescents, with few studies conducted specifically among preschool-aged children. Qualitative research informs quantitative research and guides the design of intervention and practice.32 This paper systematically synthesises the qualitative evidence on the factors influencing obesogenic dietary intake in preschool children underpinned by the socioecological model, in order to inform obesity preventative strategies. The search strategy for literature was comprehensive and was without period or language restrictions (see online supplementary table S1). We also handsearched and contacted authors of included studies to identify relevant literature. A total of 37 868 articles were identified through search of eight electronic databases in August 2012, after deduplication (MEDLINE n=20 374, EMBASE n=17 331, CINAHL n=775, PsycINFO n=1868, Web of Knowledge n=13 455, BNI n=291, ASSIA n=113 and Sociological Abstracts n=135). The flow chart of the literature search is presented in figure 1. A rerun search of June 2014 yielded 8908 articles after deduplication. The results of the 10 additional qualitative studies that met our inclusion criteria have been reported in the discussion. No additional themes emerged from these recent studies and the overall conclusions of our review did not change. Flow chart of the systematic literature search for qualitative studies on obesogenic dietary intake in young children. Qualitative studies providing a greater understanding of the factors influencing obesogenic dietary intake in preschool-aged children were included (see inclusion/exclusion criteria in online supplementary table S2). The following foods were included as obesogenic diets: snacks high in sugar, salt or fat (eg, crisps, chips, cakes, pastry, sweets and chocolate), combinations of foods (eg, fast food, junk food, convenience food and takeaway food), diets categorised by other researchers as obesogenic (eg, non-core foods, non-prudent diet and western diet) and SSBs (soft drinks, fruit juices, other sweetened drinks). A standard quality assessment tool for qualitative study designs, as specified by the EPPI centre, was used34 and investigated the following preset criteria: research questions clearly stated, approach appropriate for the research question, qualitative approach clearly justified, study context clearly described, role of the researcher clearly described, sampling method clearly described, sampling strategy appropriate for the research question, method of data collection clearly described, data collection method appropriate, method of analysis clearly described, analysis appropriate for the research question, and conclusions supported by sufficient evidence. Quality of the studies was based on the total quality assessment score—‘high’: met 9–12 quality criteria, ‘intermediate’: met 5–8 quality criteria, ‘low’: met 4 or less quality criteria. Study selection and quality appraisal was performed by one author (VMP) and all included studies were double reviewed (RL). Of the 37 868 articles, 286 papers were shortlisted for further review. From these, 17 qualitative studies describing the factors influencing obesogenic dietary intake in young children (0–6 years) were included in the review. Three additional papers were identified in August 2013, two35 ,36 through correspondence with first authors of included studies and one37 from the personal database of one of the authors (RL). All excluded studies were recorded with details and reasons for exclusion. Nineteen papers, mainly conference abstracts or PhD theses, without peer-reviewed full-text papers, were also excluded and have been accounted for in the flow chart (figure 1) as excluded for ‘other reasons’. The included qualitative studies (n=20) reported outcomes of interviews, focus groups and participant observation. A pre-piloted Excel spreadsheet was used to collect information about the study objectives, settings, sample size and selection and other details of the research methods. The data extraction and analysis followed the thematic framework approach underpinned by the socioecological model and included familiarisation of the data across the studies, creating a thematic framework, indexing, charting, mapping and interpretation.38 ,39 Data extraction involved an iterative process of reading and rereading of the studies, the identification of themes concerning views on factors influencing obesogenic dietary intake. A stepwise approach was used to compare and consolidate the initial themes into one list and finally a summary into overarching themes. Details of individual studies (including methods, emergent themes, participant quotes and author conclusions) are documented in online supplementary table S3. The thematic framework was created by RL and double-checked by VMP to ensure agreement and consistency in data extraction and reporting. Any disagreement was resolved by consensus. Several behavioural factors were identified as barriers to or facilitators of healthy diet and, despite of differences in study context and focus, 15 themes were identified with 12 themes reported consistently by three or more studies (see online supplementary table S3). The factors were thematically coded and analysed at three levels as per the socioecological model (table 1): child (1 theme), parental/family (7 themes) and environmental (4 themes). Participant (parent, mother, father, child, teacher, etc) quotes are presented in parentheses to illustrate points in respective themes. This was the only child-level theme identified and was reported by 14 studies. These studies found child's taste preferences, attitudes, likes and dislikes towards food/beverage consumption and difficult feeding/fussy eating to be factors influencing diet in young children, with parents usually offering what the child preferred. (“Your child can influence how you feed them, definitely, depending on their likes and dislikes”—Parent.37 “We feel like we've got to give our kids things all the time…because they want it, we have got to take them to McDonalds”—Mother.52) Caregivers also described strategies to overcome barriers to healthy eating: motivating and encouraging children to make healthy choices, through negotiation, repeated exposure to healthy food and opportunities for children to prepare meals. Ten studies reported that parents used obesogenic food as a reward for good behaviour. (“She then asked for a chocolate from the Christmas tree. I said she could have one if she ate a Satsuma first, which she did.” “Because she had eaten all of her food, I said, do you want some ice-cream?”—Parent.53) This practice could directly increase obesogenic food intake and also make it more desirable for children. Previous systematic reviews have stated that there is lack of evidence on the factors influencing obesogenic dietary intake in young children.10 ,13 ,14 Our systematic review of qualitative evidence identified many behavioural (parent/carer and child) and environmental (home/preschool/childcare and wider environment) factors, reported by parents and carers as influencing obesogenic dietary intake in young preschool-aged children. Almost all of the studies (18/20) were of ‘high’ methodological quality. Ten of the 12 factors/themes (per socioecological model) were reported by nine or more studies and 2/12 were reported by three and five studies, respectively. At the child's level; child's dietary preferences/likes were consistently reported by 14 studies as a major factor in child's obesogenic dietary intake. These could be appetite-related behaviours which may be enhanced by environmental influences.57 Also, preschool-aged children potentially make inappropriate food choices in the absence of parental supervision.58 Child preferences also influenced parental feeding decisions, so promoting an authoritative parenting style in addition to teaching parents easy to cook, tasty, healthy and affordable foods appears to be important. At the parental/family level, negative parent/family/peer modelling, lack of knowledge, time constraints, use of food as a reward, affordability and concerns about child's health were studied extensively by more than eight studies each and were identified as influencers of children's obesogenic dietary intake. These findings are consistent with other research on the topic.10 ,13 ,59 Parental, family and peer modelling was reported extensively by 15 studies and strongly influences the child's obesogenic dietary intake. Hence, promoting parental positive modelling should be included in any intervention. Quantitative evidence has shown that early weaning from exclusive breastfeeding60 and introduction to non-core foods early61 ,62 was significantly associated with increased obesogenic dietary intake in young children. Studies have shown that dietary intake of children is dependent on who feeds the child.63 We found that choice of obesogenic dietary intake in children had influences from social, environmental and behavioural domains. Recent qualitative studies have also reported similar findings.35 ,64–69 Preschool-aged children rely on their parents or carers for food and some children may be more vulnerable to parental unhealthy feeding habits and strategies. Maternal factors were studied more extensively than those of paternal or other carers; perhaps this is because mothers spend more time with their preschoolers and it is easier to recruit mothers to studies. Also, evidence suggests that maternal factors are associated with increased obesity in children.70 ,71 Three studies in our review reported that children who were involved in the food preparation ate healthy meals. This was also the conclusion of a recent qualitative study.72 We also found that parents who recognised childhood obesity as a problem tried to promote healthy eating habits in their children. So improving parent's identification and understanding of obesity may be a useful intervention strategy. To the best of our knowledge, this is the first systematic review of qualitative evidence on the factors influencing obesogenic dietary intake in preschool-aged children. We conducted a comprehensive search without period or language restrictions, as well as handsearched and contacted authors of included studies to identify relevant literature. We also followed preset inclusion criteria and systematic review procedures throughout to minimise selection and reviewer-related biases. All but 2 of the 20 included studies were assessed to be of ‘high’ methodological quality and only 2 were of ‘intermediate’ quality. Ten of the 12 factors/themes were consistently reported by at least nine studies. Seventeen of the 20 studies were published after 2003, indicating that most research on this topic is contemporary. Relevant studies up to June 2014 have been included in our review and this may be a limitation, but we believe that recent qualitative studies will not significantly alter our conclusions. Studies included in this review were almost all from developed countries, although a few were set in the UK. Furthermore, very few fathers or carers were included as participants, which limits the scope of the findings. There is consistent qualitative evidence that several factors at various levels of the socio-ecological model (child, parent and environment), influence obesogenic dietary intake, although modelling appears to have the most influence. These findings support the rationale for the design and testing of multilevel interventions to reduce obesogenic dietary intake in young preschool age children. Such interventions should also target the barriers to healthy eating—affordability, convenience, modelling, education, child preference, availability and advertising. The authors sincerely thank the following collaborators on the project: Dr Helen Moore for performing the search in electronic databases; Mrs Claire O'Malley and Dr Kathryn Hesketh for helping with the screening of titles and abstracts; Dr Esther van Sluijis, Professor Carolyn Summerbell and Professor Simon Griffin for their comments and guidance through the project. They also thank the following from the University of Cambridge: Mrs Sheila Palmer and Miss Isla Kuhn for their help with literature sourcing; Professor Carol Brayne, Dr Louise Lafortune, Ms Francis Cater and Ms Judith Willows for their help and support throughout. WHO. Diet, nutrition and the prevention of chronic diseases; Report of a joint WHO/FAO expert consultation. Geneva; World Health Organization, 2003.
. Is beverage intake related to overweight and obesity in school children? Hippokratia 2013;17:42–6. WHO. World Health Organization: Report of the first meeting of the ad hoc working group on science and evidence for ending childhood obesity; 2014. Geneva, Switzerland, 18–20 June 2014.
. Through the eyes of children: engaging primary school-aged children in creating supportive school environments for physical activity and nutrition. Health Promot J Aust 2009;20:127–32.
. An investigation into child feeding practices of young mothers from Tshilata village, Vuwani, Limpopo province, South Africa. Ann Nutr Metab 2013;63:543.
. Understanding how Latino parents choose beverages to serve to infants and toddlers. Matern Child Health J 2014;18:1308–15.
. Socio-cultural, organizational, and community level influences on physical activity levels of Latino preschool-aged children: a qualitative study. Ann Nutr Metab 2013;63:432.
. A comparison of parental views of their pre-school children's ‘healthy’ versus ‘unhealthy’ diets. A qualitative study. Appetite 2014;76:129–36.
. Contextual and Cultural Influences on Parental Feeding Practices and Involvement in Child Care Centers among Hispanic Parents. Childhood obesity 2015;11:347–54.
. Why do kids eat healthful food? Perceived benefits of and barriers to healthful eating and physical activity among children and adolescents. J Am Diet Assoc 2003;103:497–501. Contributors VMP was the lead reviewer with RL as the paired senior reviewer and overall obesity project lead. KKO reviewed and edited the manuscript. All the authors contributed to the study design, critical revision of the manuscript and approved the final version. Funding This independent research is funded by the National Institute of Health Research, School for Public Health Research (NIHR SPHR). The National Institute for Health Research's School for Public Health Research (NIHR SPHR) is a partnership between the Universities of Sheffield, Bristol, Cambridge, UCL; The London School for Hygiene and Tropical Medicine; The Peninsula College of Medicine and Dentistry; the LiLaC collaboration between the Universities of Liverpool and Lancaster and Fuse; The Centre for Translational Research in Public Health, a collaboration between Newcastle, Durham, Northumbria, Sunderland and Teesside Universities. The work was undertaken under the auspices of the Centre for Diet and Activity Research (CEDAR), a UKCRC Public Health Research Centre of Excellence which is funded by the British Heart Foundation, Cancer Research UK, Economic and Social Research Council, Medical Research Council, the National Institute for Health Research, and the Wellcome Trust (RES-590-28-0002).